Here it is – your fully comprehensive guide to Disney World MagicBands from the past and present! If you are following along here on Disneyways, you have definitely heard about MagicBands. We published a sneak peek for you back in 2013! These convenient little bands are your everything inside the resort: your room key (if staying on property), your park tickets, your payment method (if you have a credit card on file to charge to your room), your dining plan holder, etc. Since rolling out the original MagicBands a couple of years ago, the Walt Disney company has added some unique and limited edition MagicBands among Disney Parks guests. As these became more and more popular, Disney decided to start making Limited Edition MagicBands for special events and such. The last year saw an increase in the number of limited edition MagicBands, especially during Star Wars Weekends at Disney’s Hollywood Studios. I’ve included a good portion of the Limited Edition MagicBands that have been produced by Disney this year. Since we are still a few months away from Food & Wine Festival, Mickey’s Not So Scary Halloween Party, and Mickey’s Very Merry Christmas Party 2015, I’ve included pictures and videos of the bands from previous years. Hopefully Disney will delight us with even better bands this year for all of these events. If something you were looking for is no longer in stock – or if you require something even MORE customized – be sure to check out out friends at MagicYourBand.com and MyFantasyBands.com. I hope you enjoy our little tour of the Disney Parks Limited Edition MagicBands. 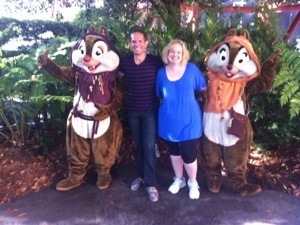 Special thanks goes out to Disneyways reader Brandon Wolgast for providing so many wonderful photos! To start our tour, I’ll choose the first big event of the year, EPCOT’s International Flower & Garden Festival. Held each spring, the Flower & Garden Festival really brings EPCOT to life in breathtaking beauty. The theme this year was, of course, Frozen and the MagicBands matched the frozen theme. The band has a picture of Anna & Elsa on one side and a nice floral pattern on the other. This was a limited edition of 5,000. The following video shows what the band does when touched to a touch-point in the park. Next up we have the MagicBands from the Frozen Summer Fun event held at Disney’s Hollywood Studios last year. I have not seen or heard of any from this year, but that could be a mistake of my own. These bands sold out fairly fast and were very cute. These had a picture of Olaf on one side with the words “Chilling in the sunshine” above him and “Frozen” on the the other side. Limited edition of 5,000 as well. The following video shows what this band does when touched to a touch-point in the park. Next we have a generic Olaf MagicBand that, suprisingly, is still in circulation and available in the parks (as of a month ago – found in Animal Kingdom for sale). These MagicBands aren’t for any particular celebration other than celebrating the awesomeness that is Olaf. On one side they have a picture of Olaf in a Santa hat and on the other side it has snowflakes. This is a limited edition of 4,000. Next comes the magic that is Star Wars Weekends. As the force descends upon Disney’s Hollywood Studios for weekends throughout May, MagicBands of all sorts and star systems show up. 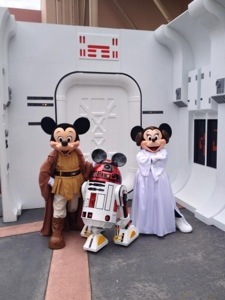 This year had a fairly impressive line-up, including Mickey, Donald and a couple of lightsabers for Galactic Gathering guests. First up is the Donald MagicBand. On one side you have Donald holding a purple lightsaber (I thought only Mace Windu had a purple saber, but that’s me). On the other side, you have the Star Wars Weekends logo. These were a limited edition of only 2,500 and sold out very quickly. Next we have the Jedi Mickey band. This band has Jedi Mickey on one side holding a non-impressive (in my opinion) light blue lightsaber. On the other side there is the Star Wars Weekends logo. These were also a limited edition of 2,500 and sold out quickly as well. Next up you have the two most limited edition bands found in the park this year: the red lightsaber and green lightsaber from the Galactic Gathering. These were only available to Galactic Gathering guests and were an extremely limited edition of only 350 for the red and 330 for the green. These awesome bands look like a lightsaber from one side to the other. I only have pictures available of the green, but they are identical in everything but the color. The following video shows what the red band (first video) and green band (second video) does when touched to a touch-point in the park. Next up we have the bands from last year’s Mickey’s Not So Scary Halloween Party. These bands have the Mickey’s Not So Scary Halloween Party logo on one side and a cool Halloween themed design on the other. These were a limited edition of 5,000 and were originally only available during the Halloween Party. However, they did not sell out so they were later released as general sale items. Finally, we have the Mickey’s Very Merry Christmas Party bands. These are candy cane colored and have the party logo on one side and Mickey & Minnie on the other. These were again a limited edition of 5,000 and originally only sold during the Christmas party, but never sold out at the party so were released later. I hope you enjoy our little tour through the MagicBands. This is in no way a comprehensive list of every available MagicBand (that would take a very long time to compile and would be out of date as soon as it was posted) but a list for you to enjoy and know about. Have a happy day and we’ll see you with your MagicBand very soon! AND for great ways to spruce up your ordinary MagicBands, visit our friends at MagicYourBand.com and MyFantasyBands.com. This awesome parade is from the very first day of Star Wars Weekends – May 17, 2013. The celebrity guests, character meetings, special maps, food and all the fun of Star Wars Weekends make them a can’t miss! Once you click this link you will be able to watch the entire parade in three parts with no further action on your part. Thank you Ramon Rodriguez of Theme Park Concierges.com for the awesome job as cameraman! In addition to everything else, during our wait, Ramon managed to get breakfast for us AND deliver a soda for a woman in an EVC. He is so considerate of others and it is always great to be in his company. Ramon and I got our spot along the parade route nearly 2 hours early to make sure to get the best video possible for you today. We hope you will enjoy it along with all of our other great blogs about Star Wars Weekends! And now…get ready to see all your favorite characters including Chewbacca, R2D2, the amazing parade of Stormtroopers and so much more! 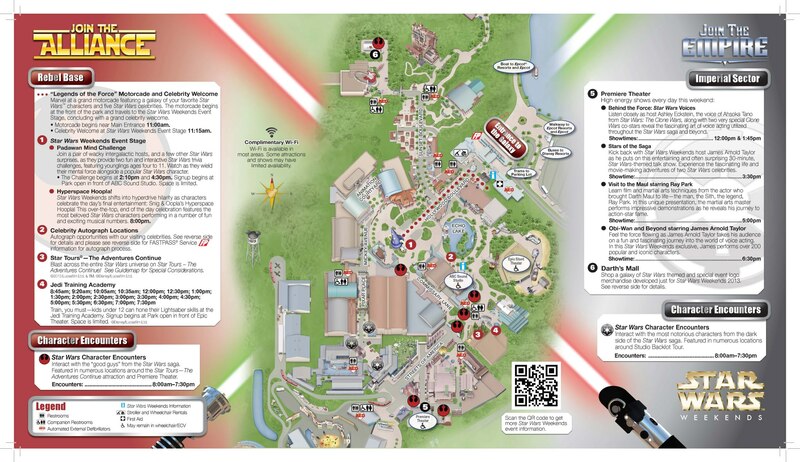 2013 Star Wars Weekends Entertainment…Food…and Merch oh my! Check out all the Star Wars fun beginning today!! 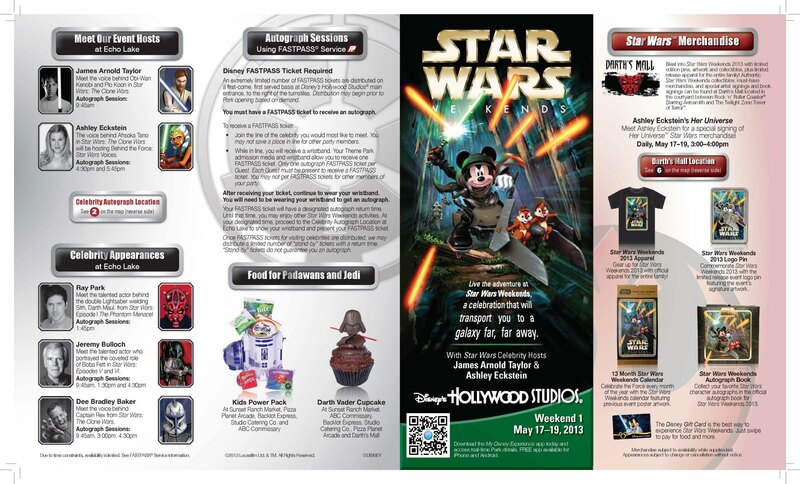 A galaxy of Star Wars themed and special event logo merchandise developed just for Star Wars Weekends 2013. Click here to see the map for week one! As always, Disney reserves the right to change this information at any time, without notice. May 4th Disney celebrated “May the 4th Be With You” as part of Limited Time Magic. May 6th we were one of the first sites to post an unofficial list of Star Wars celebrities expected to make an appearance at Hollywood Studios for Star Wars Weekends 2013. Today we are happy to report Disney has finally officially released this information as well. New this year is a photo opportunity with a “life-size” rancor. The giant beast, which was Jabba the Hutt’s prized pet in Star Wars: Episode VI Return of the Jedi, will be on display during the event. The handcrafted replica is 17 feet long and weighs more than 700 pounds. The reptomammal sculpture is well-traveled — it’s a popular piece at Star Wars events around the globe and will make its way to Walt Disney World for Star Wars Weekends. Also new – a trio of specialty “one-man shows” will be presented this year, giving guests a peek into the on- and off-screen worlds of three Star Wars celebrities — James Arnold Taylor, Ray Park and Warwick Davis. “Obi-Wan & Beyond” (each event day) stars James Arnold Taylor. James takes audiences on a journey into his wonderful world of voice acting. “Visit to the Maul” (Weekends I and II) features Ray Park. Guests can see a demonstration of amazing martial arts skills by the actor who portrayed Darth Maul on the silver screen. “An Ewok’s Tale – my short story” (Weekends II and III) stars Warwick Davis. Guests get a unique look into the fascinating world of this Star Wars legend. As you plan your visit to Star Wars Weekends, be aware that many of the behind-the-scenes shows reach capacity quickly, so arrive early. Also, you’ll want to arrive early to the park if you would like to get a celebrity autograph. Join the conversation online by using the hashtag #StarWarsWeekends on Twitter. Here’s the full list of Star Wars Weekends celebrities for 2013 according to StudiosCentral.com – dates and celebrities always subject to change. In addition to the celebrities listed above, Ashley Eckstein and James Arnold Taylor will also be available to meet every weekend of Star Wars Weekends. For more information on SWW click here. For photos and video of May the 4th be with you – click here. Star Wars Weekends is an annual special event at Disney’s Hollywood Studios that celebrates the legendary Star Wars Saga and the animated television series, Star Wars: The Clone Wars. On Friday, Saturday and Sunday of each weekend, you can join celebrities and characters for special shows, panels, presentations and more. 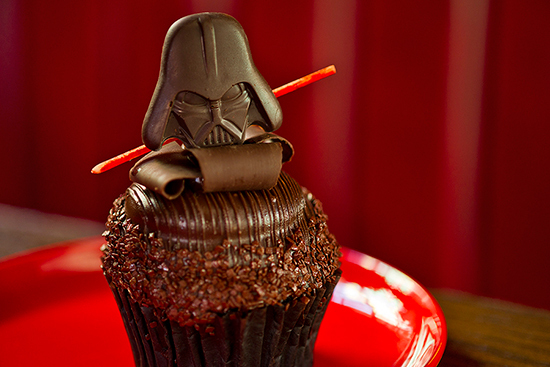 The dates for 2013’s Star Wars Weekends at Disney’s Hollywood Studios have been announced. The Disney Parks blog revealed the special event weekends will be May 17-19, May 24-26, May 31 -June 2, June 7-9, 2013. Click HERE to see Star Wars 2013 Merchandise. James Arnold Taylor and Ashley Eckstein will be the celebrity hosts for all 4 weekends. Disney’s Hollywood Studios admission is required. Availability is limited for some events, which may be cancelled at any time. In 2013 there will be more than 60 characters representing all six of the Star Wars films: Star Wars, The Empire Strikes Back, Return of the Jedi, The Phantom Menace, Attack of the Clones and Revenge of the Sith. This is the first year Star Wars Weekends will be run under new ownership, so to speak. Walt Disney Company recently purchased Lucasfilm and owns the rights to Star Wars including plans to release three new films in years to come. Guest appearances subject to change without notice. Disney’s FASTPASS Service will be used for all autograph sessions during Star Wars Weekends. It works the same as it does for attractions. A limited number of FASTPASS tickets are available. You will pick up your ticket with a scheduled autograph return time (instead of a ride time). You then get to go enjoy the park until your FASTPASS autograph return time. When your return time comes you just go to the autograph location. Each guest must be present to receive a FASTPASS. Once the tickets for an actor are gone, Disney will distribute a limited number of stand by tickets with a return time. Check the park guide for more details.